One of the best things about Columbus is the unique and fun-filled neighborhoods throughout the city, each with its own charm and character. We invite you to explore places you’ve never been, or perhaps to rediscover an old favorite. Join us for our next evening event in Hilliard to enjoy food, drinks, shopping and networking with your peers, plus get to know this beloved Columbus neighborhood. 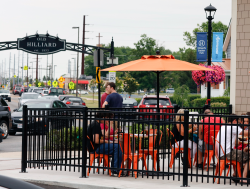 Sept. 13 | 5-8 p.m.
Hilliard is a charming, vibrant community located 15 minutes northwest of downtown Columbus. Start at Hilliard Station Park to check in, network with peers, enjoy complimentary hors d&apos;oeuvres and pick up your passport to discounts and samples (more information coming soon!) After, head out to explore restaurants, shops and all the area&apos;s excitement. Take a photo of your experience at each place you visit and use the hashtag #cbusneighborhoods for a chance to win a Hilliard prize pack. The more places you visit, the better your chances to win! All registered guests will also receive a complimentary gift card to one of our Hilliard partner businesses!